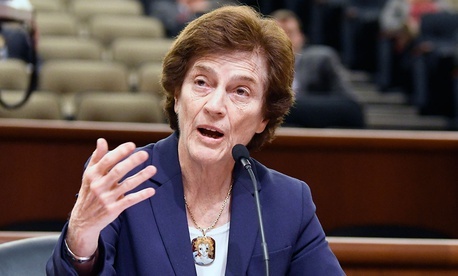 A prominent advisor to the Department of Homeland Security, Elizabeth Holtzman, quit her position last week in protest of Donald Trump’s immigration policies. In her resignation letter, dated July 16, she says that agency head Kirstjen Nielsen should really be the one stepping down, instead. Holtzman was one of four members of DHS’s Advisory Council who resigned last week, citing the practice of separating immigrant children from their parents. A federal court has ordered that the Trump administration reunite detained families by this Thursday, July 26. But Holtzman, a former US congresswoman and New York City district attorney, had some things left to say. In her letter, Holtzman describes forced family separation as “child kidnapping, plain and simple,” and described Trump’s general immigration policies as “malign and ultimately self-destructive.” She also reminded the Trump administration that the U.S. has historically welcomed hundreds of thousands of immigrants fleeing oppressive regimes. “Considering that history, the thought that the U.S. government is afraid today of 2,000 children and their parents is both laughable and appalling,” she wrote. Holtzman was one of the authors of the 1980 Refugee Act, which helps refugees settle in the country. DHS spokesperson Tyler Houlton said Holtzman’s resignation was disappointing, but that he was not surprised to see an appointee of a previous administration leave the council. “It is unfortunate that instead of first bringing their concerns directly to the secretary in the spirit of an Advisory Committee member, they chose to simply resign four weeks after the administration ended the practice of concern,” he added, referring to Trump’s executive order in June that ended the unpopular policy in response to widespread public outcry. Members of the advisory council, who are outside experts charged with providing insight to DHS, are appointed by the agency’s secretary. Holtzman was named by former secretary Jeh Johnson, during the Obama administration.